Exiled Razaniyyat – Personal observations of myself, others, states and exile. Being a neither/nor person is not easy in peace times, it’s stressful and painful in times of war & exile. It’s an isolating position. In virtual spaces like this one, you’re under risk of being attacked, discredited, and ridiculed if you’re a woman. Many times mansplained. I was almost called a “traitor” by a dear friend. Called a “White Syrian” by another. Most of my attackers are men identified as revolutionaries. I had to restrict, unfriend and block to protect my well-being in spaces like Facebook. All because I am not only a dissent to Assad, but to problematic dominant narratives in revolutionary circles, especially adopted by self-identified intellectuals. That’s why many choose to not speak. Especially women. And I know many whom I speak to in private chat rooms and gatherings offline. Many of the anti-Assads who have different views from the dominant narratives don’t speak. What you hear is not representative of all revolutionary opinions. The dominant narratives on Syria exclude and attack non-conforming opinions and discourses. I self-censored myself but my determination to speak mirrors my determination against Assad. It’s the job of the White Helmet to protect civilians. Doing your job shouldn’t be celebratory. Unless you’re saying this service is exclusive to opposition areas, or to Sunni civilians. So when it’s extended to non Sunni and non Opposition areas, it should be celebrated. Be careful of your dangerous coverage and your discourse. It embodies Syria partition you claim to be against. No. The revolution is not pure. The bombing of residents of Damascus, Aleppo, Sheikh Maksoud & other areas were not genuinely being condemned as the ones done by Assad and Russia. Sometimes they were even cheered for out of vengeance. It’s a mere act of propaganda to use the photos of people helping the injured to whitewash all of opposition and rebel crimes. This is cheap and shameful. Not revolutionary. It’s worth explaining what exactly you mean by “the revolution continues” when you say all of the above problematic positions that confuse the hell out of me. And I am a protester for 3 years. Anti-Assad since 2006. Personally, my revolution started at home at the age of 15. Being part of the popular uprising was the most beautiful act I’ve ever done. But it’s clear that my definition of revolution is different than most. And close to handful of comrades scattered worldwide. Down with all states bombing Syria. Down with all armed groups. Down with propagandists. And viva the people’s struggles in Syria, the region and worldwide. I was just on the phone with one of Lloyd Bank International advisors answering questions on whether I am “eligible” to open a dollar account there. After answering questions related to my address, place of residence, reasons for open the account etc, I was asked on my nationality. I answered that I have both Syrian and American citizenships. The advisor then put me on hold for few minutes, and returned with further question on my Syrian citizenship. Are you planning to got to Syria soon? When was the last time you’ve been in Syria? Do you have property in Syria? Family members live there? I answered that I myself cannot go back to Syria for security reasons (my name is listed on the boarder by Assad regime), and I mentioned that my family are still there and hence they have an apartment a car. That’s when I am told I am ineligible to open an account at Lloyd Bank International. I got furious, and still furious, not because I couldn’t open an account- I have developed resilience the past five years that will enable to deal with that. I was furious because Syrians are punished in this world on all levels. I told her that these procedures pose as further pain for people who fled the war for their safety. For those who want to continue with their lives but are punished for their government’s criminal actions. The logic is outrageous. It is expected of any citizen in any country in this world to be a resident and have a property in that country. But according to Lloyd International Bank, Syrians are not expected to visit Syria, are not expected to have family members in Syria (and won’t welcome refugees either), and are not expected to have properties there. The advisor even told me “you know as you just said, because there is war and you yourself cannot go back for security reasons, I am sure you’ll understand why we can’t proceed with your request.” That’s when I told her that I am not sure how detention, barrel bombs, chemical weapons, cluster bombs among other weapons used by the government against its own people on a daily basis, will affect Lloyd bank in the UK. People ask me what they can do to help Syrians, and the answer is simply: identify what are the threats facing Syrians today (Assad, IS and warlords), identify policies and procedures that punish them for feeing war and wanting to have a life (not welcoming them in safe counties, residency/job applications in the region; Turkey, Lebanon and Jordan) and also policies like these from private institutions that treat citizens who fled death sentences, as a threat. There is something that have been part of me all my life but I did not write it down before. I was ashamed of it. Felt guilty towards it. I wanted to change myself to become another person. Now, I think I am finding my inner peace and want to dedicate this coming out story to all the people like me in the world. I am one of the awkward persons you meet in your day or week. That’s it, I’ve said it. I feel so much better. You see, light social conversations are a nightmare for me. I am very bad at meeting new people and finding the right, light, casual, not too deep and not too shallow conversations to make at certain occasions; dinners with acquaintances, getting-to-know-people-closer meetings, orientations, the social meetings after the panel discussions or conferences, classmates, flatmates, neighbors, distant family members…etc. Of course, over time (since I am 35), I have worked hard to “perform” a social person in all of these meetings. Sometimes it works very well and sometimes I make embarrassing remarks or positions. I used to be ashamed of those. So very much. Now I don’t think I care much. Perhaps it’s a good thing not assimilate, I tell myself. It’s OK not to fit in all the time. Especially I “trained” myself very well to give the impression I am an “everybody person.” Not awkward at all. Performativity makes wonders. Unlike casual and light conversations among strangers or acquaintances, I find meeting a very small number of people, sharing drinks, cigarettes and having nice, personal and honest conversations very refreshing and empowering. These are my favorite moments about life. I am scared of meetings that revolve 20-40 people. I say nothing in those meetings and I feel very self-conscious. Whereas I feel confident at meetings that revolve 100 ppl or more. I was scared of public speaking but then I became fond of it, especially meeting with like-minded activists and comrades. I can only do bonding-kind of relationships. That’s why I take friendships very seriously. And that’s why I sometimes value people I shared great moments with online (blogging or uprisings for ex) even though we haven’t met in person. I don’t think I believe in the concept “socializing.” My brain and body don’t get it. I get disappointed at romantic relationships that don’t involve a real bonding. Interestingly enough, not all people need that sort of thing to be “in love.” I do. In fact, I can only function in relationships (friendships or romantic ones) that center around bonding. It took me a while to understand this thing about me. I am a very literal and precise human being. I love examples, long explanations. orientations, well-structed and detailed talk. Because my mind goes like this @($$&%^$(#(@ when I hear a general talk. Use your words carefully, please. I am very organized towards everything (meetings, dates, relationships, conversations, cleaning, buying, planning, going to a bar etc). I wish I wasnt but I am. I am so loving this post. I am very punctual (unless I am down, unmotivated or depressed) and being punctual among a culture of unpunctuality is, well, frustrating, to say the least. I stop meeting with people who show up 30 or an hour late. I totally get turned off. I bond very easily with animals. Not sure why I typed that here. Hmm. Now the good stuff: I talk to myself a lot during the day. Part of my well-being is to understand myself, my new self that evolved during the uprising and the war. After all, I am living with myself ALL DAY. All my life. Sometimes I am not my self and I don’t recognize it. How to deal with that? My solution is that me and myself should talk about it. These are not simple things. Not common things either. These habits and manners of thinking are sometimes isolating at occasions where casual talk or socializing is a “professional” part of your life as a student or worker. Even in your social and intimate life. These types or preferences of relationships is difficult when you’re in exile or when you’re a refugee. Saying goodbye to your close friends and family, and entering a whole new space to find new ones, demands a lot of patience and energy that sometimes you have none. Finally, I am so happy that I came out to this blog’s readers. To the people who feel they’re awkward; love your self and be confident about it. Life is too short to be ashamed. Packing to UK, Zeitun did not like it, but he has new good owner now. So many things attached to this blog and its newly-constructed meanings over the past 5 years pushed me away from it. Its title, is one of them. The spotlight and the fixed fashionable terms that I don’t intend to discuss in this post. Perhaps later (I am so good at postponing anxiety). Right now, I am changing the title from Razaniyyat to “Exiled” one. As some of the readers of this blog know, I was born in the US, so unlike millions (literally) of Syrians today who wish or dream of obtaining refugee status or a new passport, I don’t need to. The opportunity of leaving Syria has been there ever since I was born 35 years ago, in Florida. I am so much privileged that worrying about visas or safety is not an issue for me. This privilege alienates me from understanding or comprehending the need of “refugee” or comprehend really what constitutes as “unwanted citizens” of some countries like Syria, Palestine, Iraq among others. Even thought that my own brother had to cross the sea like tens of thousands other Syrians. I called the smuggler, was part of the money negotiations and the whole process. I still did not cross the sea. Despite this feeling of alienation, I’ve learned that it’s not productive to feel guilty on things you cannot change about yourself or your privileges. “Invest in resources, Razan.” I keep telling myself. Even though I could not register as a refugee, it doesn’t mean I, too, did not have to leave as well. Like tens of thousands of residents in Syria (Syrians, Palestinians, Kurdish-Syrians among others), I left Assad and IS. But unlike many male opposition activists residing today in so-called Northern “liberated” areas, I also left the male-dominated opposition territories. As many of you know, dozens of Syrians left Assad’s controlled areas because of their political opinion and activism that will put their lives (and their families) in danger. My room in Leeds, UK. Hence, some went to what’s been called as “liberated areas” in Northern Syria- lands and territories that are liberated from regime’s control and are now controlled by brigades close to the opposition. I lived there for 9 months and 20 days in 2013. Unveiled single woman activist. It was a very draining and perhaps next to impossible to be as such in the area – a discourse you rarely hear from male opposition and media journalists or writers who’ve been or living in these areas. Today, if I want to go back to the “liberated areas” I must be veiled, and preferably with a husband. Like tens of thousands of residents of Syria I fled Assad and IS. But unlike many male activist and revolutionaries, I also left the male-dominated opposition lands too. Exile is my only option. This blog is going to be about this journey of exile into unknown paths and future. Thomas Keenan moderates a discussion with our friends, the great Yassin al Haj Saleh and Eliot Higgins (Brown Moses), on the situation in Syria. We live in a world where images of violence and atrocity regularly flow from battlefields and streets in conflict, and circulate with increasing velocity. Whether they are intended to terrorize, shock, expose wrongdoing, “raise awareness,” or simply show what’s happening — and whether they are made by journalists, fighters, activists, citizens, or even satellites and surveillance cameras — they appear before us and ask us to respond. They raise not only political questions, but ethical ones as well. They are ultimately addressed to public opinion, and their fate is uncertain. Do they end in action, engagement, avoidance, prejudice, empathy, revulsion, memory or oblivion? This discussion focused on images from the war in Syria, and explored a range of things to do with them. Between me and Razan there are those tiny stories that do not belong to and cannot be classified as one of those typical close relationships between friends. We weren’t friends. To me, she was the woman whose path is always crossing mine, a hard working woman who values human life more than any other values favored by other humans. She believes everyone is equal and everyone deserves the same treatment from law. Razan is a true human rights activist who doesn’t just write statements, but actually commits to advocating human rights and equality in her daily life. Razan cannot be racist, sexist, Islamophobic, homophobic or carry a prejudice, she only targets abusers. An abuser is he who commits a form of injustice against another. Period. Razan’s idea of human life is this simple, and it’s quite admirable to see it remain the same during the world’s most recent crisis. 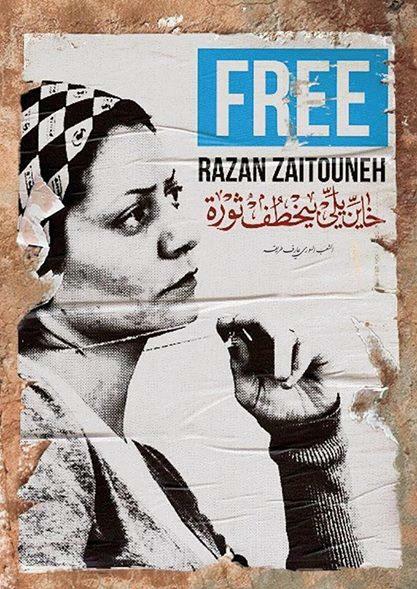 That’s Razan, that’s my mentor; despite knowing her name neither the world, nor many Syrians, even know her. I woke up around 4 AM. I thought about you a bit, well a lot, then watched another episode of House. I sat in the balcony for the first time ever since I moved in to this studio of mine, smoked a ciggie then went back to bed. I woke up again around 7 AM, wore gym clothes then went out for a quick run – the first time I do it in my life. I lived. Past tense. I lived nine months in a place called Nomy. Nomy was a strange town, I have to say. But that’s not what I want to talk about today.